Ticks are found at the edges of grassy fields, low-lying underbrush, near water (including swamps) and urban areas, especially if deer are present. Ticks have been reported in Perth County and have been found on many dogs and cats. According to the Public Health Agency of Canada, certain locations are endemic, such as Point Pelee, Rondeau Provincial Park, Turkey Point, Long Point, Prince Edward Point and Thousand Islands. There are two “blooms” in the tick population each year, occurring in the early spring and late fall. Tick bites will be most common during these times. When the tick bites, it attaches by its head and engorges by ingesting blood. Several days later, the engorged tick falls off its host. The bites are not painful, but can cause irritation (reddening) of the skin and minor swelling which can last up to a few weeks. There are several species of ticks. The Deer tick, also known as the Blacklegged tick, feeds primarily on white-tail deer in its adult form, but all life-stages of the tick will feed on dogs, cats and humans. The Brown Dog tick is becoming more common in Eastern Ontario. This species of tick can live inside homes and dog kennels. Deer ticks transmit Lyme disease. In 2013, our clinic diagnosed one positive Lyme disease case in a dog that lives in Mitchell. Although cats can get tick bites, they are not prone to the Lyme disease infection. Here in Perth County, we are not in a high risk region, but the trends would suggest that ticks are on the rise in this part of the country. 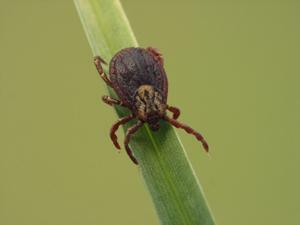 When a tick bites a human or dog it can transmit the bacteria (Borrelia burgdorferi) through its saliva. The majority of dogs show no symptoms after becoming infected; however, a small number of dogs do develop symptoms. In the early stages, 4-6 weeks after a bite, symptoms can include fever, decreased energy, swollen lymph nodes, decreased appetite and limping. The treatment for dogs that get sick is a course of antibiotics. If left untreated, certain dogs may develop irreversible kidney damage. Symptoms of Lyme disease in a person are different from those in dogs. The big question is: what should we do about ticks? Prevention of tick bites plays a key role in preventing Lyme disease. You can keep your pet on a trimmed lawn and on a leash when in the woods. 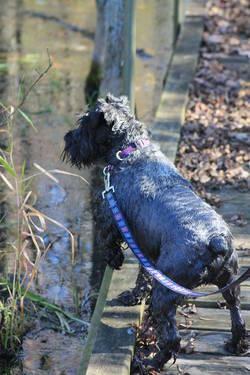 It is recommended to look for ticks by combing through your pets’ fur when they come back from playing in wooded or long grass areas. If a tick is on your pet, you can remove it at home by twisting it at the head with tweezers, or it can be removed by a technician at our Stratford office. There are several topical veterinary products that kill and repel ticks. For dogs traveling to a high risk region for Lyme disease, vaccinating dogs is also an option. 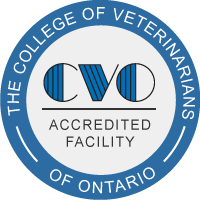 Coventry Animal Hospital tests your dog for exposure to Lyme bacteria at the same time we perform a blood test to screen for exposure to heartworm.